The parish of Carleton Rode is located in South Norfolk, south of Wymondham west of Attleborough. Modern settlement is dispersed throughout the parish, with many of the buildings situated alongside straggling roads. Some of the roads may mark the edges of former commons. The name Carleton Road applies to the central cluster of buildings, with the similarly sized hamlets of Flaxlands, Upgate Street and Hargate elsewhere. Carleton Rode parish has seen a reasonable amount of archaeological work. Many fields were examined as part of a fieldwalking survey of Bunwell and the surrounding parishes. Quite a lot of metal detecting has taken place and plenty of stray finds have been recorded. There are numerous listed buildings. Fieldwork has taken place in most parts of the parish and as a result it is reasonably straightforward to draw conclusions about the distributions of finds and sites. Prehistoric flint artefacts have been found throughout the parish, with most found in the southeast on land rising up from the River Tas. Although it is not possible to date many of these more closely, it is possible to date a good number. These include at least two Palaeolithic flakes, Mesolithic artefacts, a miniature Neolithic axehead (NHER 23418) and Neolithic scrapers. Burnt flints have also been discovered. Those from a site close to the River Tas suggest the presence of a prehistoric burnt mound (NHER 23418). Bronze Age objects have been recorded at sites dotted all over the parish. A hoard (NHER 10022) of over twenty Bronze Age metal objects was discovered in 1844. It included at least twelve axeheads, one spearhead, one palstave, one hammer, two chisels and five gouges. Items from elsewhere include a dirk, a dagger and at least four spearheads. Beaker pottery found close to the possible burnt mound point towards there being a domestic site nearby. The parish has yielded a relatively large number of Iron Age objects. In 2004 a metal detectorist found a hoard of two terrets and a harness mount or plaque fragment (NHER 39434). Six coins are recorded, as are a pin, a boss, at least one further terret and at least one brooch. Pottery has been found at least three sites. Double Banks (NHER 9201) joins with Bunn’s Bank (NHER 9206) near Besthorpe and is a single bank with a ditch on either side. It could be an Iron Age defensive earthwork, although it is equally possible it is Saxon or medieval in date. Both it and Bunn’s Bank were used during the medieval period as a boundary of Buckenham deer park (NHER 44620). It has been suggested that a Roman road (NHER 9219) ran along the western edge of the parish and Roman objects have been collected at over twenty sites. At three locations the quantity and types of building material, pottery and metalwork discovered suggests that there were buildings and settlements present. Two of the locations are in the south of the parish close to Hargate (NHER 16779/23847 and 21959/23002), with one in the north (NHER 34589). Finds from the northern site include part of a patera and two votive objects. The settlements may have been farmsteads or hamlets. 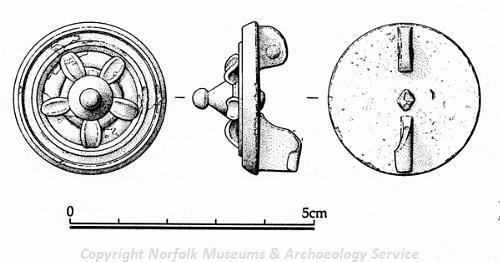 Early Saxon objects discovered include brooches, a silver ring, a glass bead, pottery and a rare 6th century gold bracelet (NHER 21959). All three of the possible Roman settlements sites have yielded Early Saxon artefacts, providing hints that they may have continued to be used in some way. 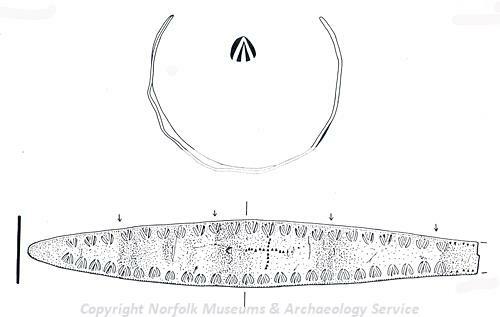 A mount, a brooch, a fragment of a wrist clasp and a bronze strip (NHER 34859) from a site near Hargate suggest that people may have been buried there. Middle Saxon pottery has been found at two sites in the parish. Other objects of this date include pins and a strap end. 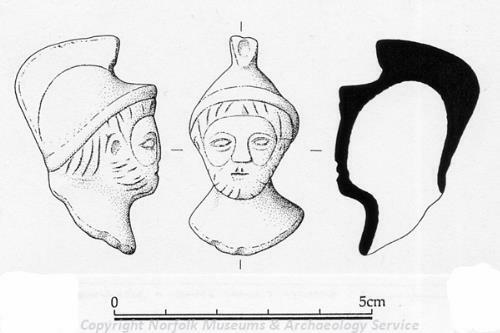 Late Saxon pottery, strap fittings, stirrup terminals, a bridle cheek piece and a coin of King Cnut are also recorded. Carleton Rode is recorded in the Domesday Book of 1086 as ‘Carletuna’. This is an Old English or Old Norse name meaning ‘enclosure of the free peasants’. ‘Rode’ was probably added in the 14th century; in 1346 Robert de Rode held land in the parish. In 1086 King William I, Count Alan, William of Warenne, Roget Bigot and Eudo, son of Spirwic were listed as landholders and two churches were recorded. One church probably stood on the site of the present All Saints’ (NHER 10039), whilst the location of the other is unknown. In the 18th century Blomefield recorded a medieval chapel. Its site is also not known, but it is possible that it stood where the Domesday church was. There may have been a medieval moat (NHER 23271) southwest of Hargate. The medieval deer park (NHER 44620) associated with Buckenham Castle abutted the western edge of the parish. Two straight hedged and ditched field boundaries (NHER 9219) mark a section of the park’s western boundary, with the Double Bank marking the northeastern segment. Medieval and post medieval objects have been recovered from over fifty sites. The house at Flaxlands Farm (NHER 23160) has been altered and renovated, but is essentially a medieval timber framed hall house. Although mostly post medieval, 22 Bunwell Street (NHER 36123) may have been also have begun life as a medieval hall house. Carleton Manor is a 16th century timber framed house and West View may be late 16th or 17th century. 17th century buildings include those at Fen Farm, Church Farm, Ash Farm, Poplar Farm and Corner Farm. Southview (NHER 39685) is a 19th century clay lump house. In the west of the parish is a 19th century brick steam mill (NHER 11808) that is now used as a house. Faden's map of 1797 shows a windmill here and by 1807 there were two windmills on the site. One of these burnt down in 1908. Close by was a site of a post medieval Admiralty semaphore telegraph station (NHER 14978). A tower windmill (NHER 9234) was built in the northeast during the 1830s, was converted from wind to oil power after 1904 and collapsed in August 1958. During World War Two there was a searchlight station in the parish. In 1960 an Orlit post structure and an underground chamber (NHER 11809) were constructed on the edge of New Buckenham Common. They served as a Royal Observer Corps post until 1968. David Robertson (NLA), 10 February 2006.
http://www.norfolkmills.co.uk/Windmills/carlton-rode-towermill.html. Accessed 10 February 2006.